They are all around us – more than 10,000 people living with Parkinson’s disease in Western Pennsylvania. They have chosen to quietly persevere with grace and dignity. In doing so, they bring a renewed purpose to their lives and a meaningful lesson to our own. For this example, we are grateful. On April 1, 2015, with the help of Miami University’s Business Fraternity, Apple Box Studios and the Parkinson Foundation Western Pennsylvania took to the streets of Pittsburgh and the online community to spread the word about Parkinson’s. April is Parkinson’s Awareness Month. To increase organization and disease awareness as well as raise donations to PFWPA, Apple Box Studios and PFWPA created and recently launched an ongoing, integrated social media and content marketing campaign. The campaign was centered around the hashtag: #GraceToGive, which is tied into the Parkinson Foundation’s brand message and tag line: perseverance, grace, purpose. Our team and PFWPA embraced several moving parts in order to fuel the #GraceToGive campaign, but the kickstart and highlight was a guerrilla marketing initiative that took place on Friday, April 3. 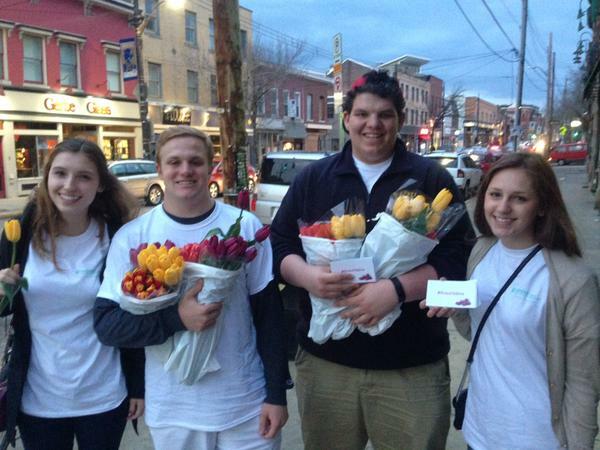 Apple Box, PFWPA and Miami University’s Business Fraternity gathered 1,000 donated tulips (the official Parkinson Foundation flower) and 1,000 branded #GraceToGive cards and hit the streets of Pittsburgh Friday evening. 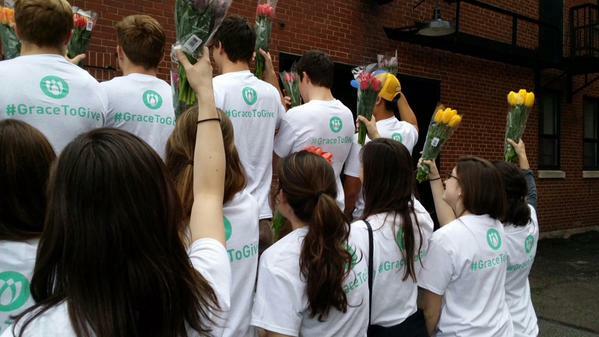 Sporting our #GraceToGive t-shirts, our group was able to color the Cultural District and Liberty Avenue, Market Square, the North Side, Lawrenceville and the South Side Works with hundreds of tulips and #GraceToGive cards. Pittsburgher’s not only accepted the tulips and cards with wide smiles and open minds, but our group was pleasantly surprised how many people responded with personal stories of someone they know living and persevering each day with Parkinson’s Disease. The picture below shows four of our student helpers from Miami University gearing up with bundles of tulips and cards to give out in Lawrenceville. Catherine Wertz, 20, a sophomore from Miami University in Ohio and daughter of Mike Wertz (Apple Box Studio’s Owner and Creative Director), was one of the fraternity members handing out tulips and cards at Katz Plaza with our group. She and her father have seen the physical effects of Parkinson’s disease on her grandfather and Mike’s father, Ron Wertz, former president of the Hillman Foundation. But they have also seen him continue to live an active and inspiring life. “He kind of uses Parkinson’s to live his life to the fullest. He travels frequently. He’s always helping my nana around the house,” Catherine said. PFWPA provides support groups, exercise programs, educational sessions and other programs for about 13,000 other people like Catherine’s grandfather – both those with Parkinson’s and their caregivers. The Foundation is completely funded by grants and donations, which is keeping our teams motived and determined to spread #GraceToGive even beyond April. As an integrated campaign, Apple Box and PFWPA produced and released 13 billboards that now can be spotted across Pittsburgh that feature the hashtag and direct readers to the foundation’s website where #GraceToGive is an every page callout. We also released a public service announcement on KDKA Radio and 30-second TV spot. The short video PSA produced by Apple Box Studios and can be seen below. Besides our collateral and outreach efforts, the #GraceToGive hashtag can be searched online to find several other photos, flagship videos, tweets and Facebook posts about the campaign. The campaign was also featured in a recent TribLive article that can be read here. For more information or if you can find the grace to give, visit PFWPA online. Are you or someone you know persevering each day with Parkinson’s disease? Tell us your story or tweet us in support with the #GraceToGive hashtag: @PFWPA and @AppleBoxStudios.